As the months of the year fly by I’m becoming much more aware of the fact that my 35th birthday will be here in 18 months and I’ve barely made a dent in my 35 before 35 list. Number 15 on my list is ‘personalizing my home’. I’ve decided to tackle that one this summer. 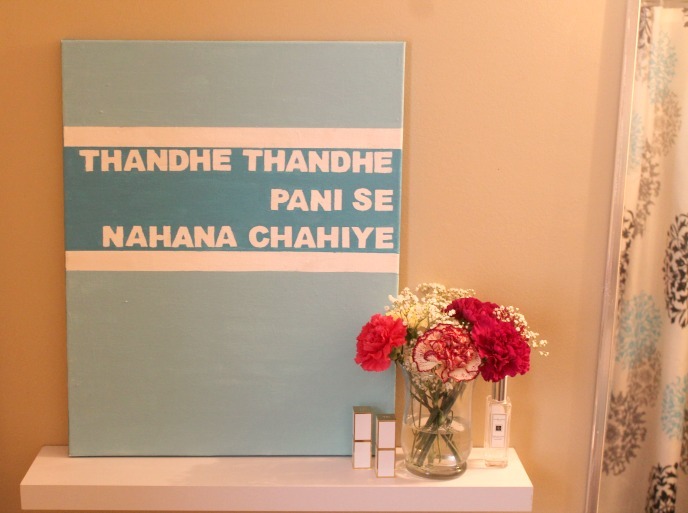 First up, this fun Bollywood inspired canvas art I made for our boring and bland bathroom. 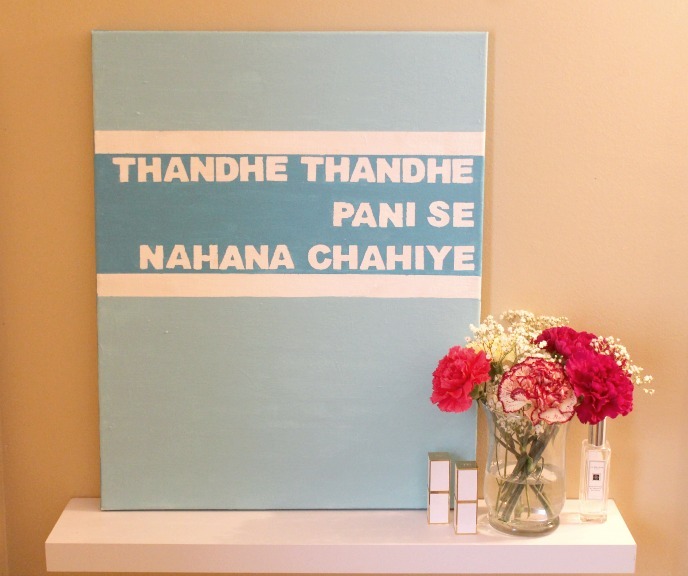 I’d been planning to do some Bollywood quote inspired canvas art for a while, but just couldn’t choose one quote. 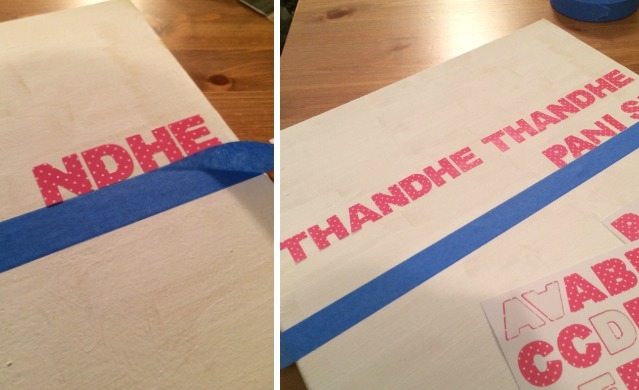 Once I decided this piece would go in the bathroom, there was only option; ‘thande thande pani se nahan chahiye’! I wish I could share a really detailed DIY but this was a weekend project that came together really quick, and I sort of forgot that I blog about DIY’s while I was doing it….. #badblogger. Start with a blank canvas and then write out your quote with sticker letters or stencils. I used some painter’s tape to keep my letters straight. It helps to work backwards when spelling out your quote, and to use a finger space between words like elementary school. Once your letters are pressed down, paint over them with the colour of your choice. I created a striped pattern with two colours. Peel up your letters and voila – easy canvas art! Since I already had the canvas, paint, vase, and toiletries at home, and I buy flowers every week, the only expense for creating this little vignette was the floating shelf. We picked it up at Target for $5.99, so this was definitely a budget friendly project. I’m planning to do another piece of canvas art with one of my favourite Amitabh Bachchan quotes so I will be sure to do a more detailed step by step on my next attempt. What quote would you choose for your canvas art? 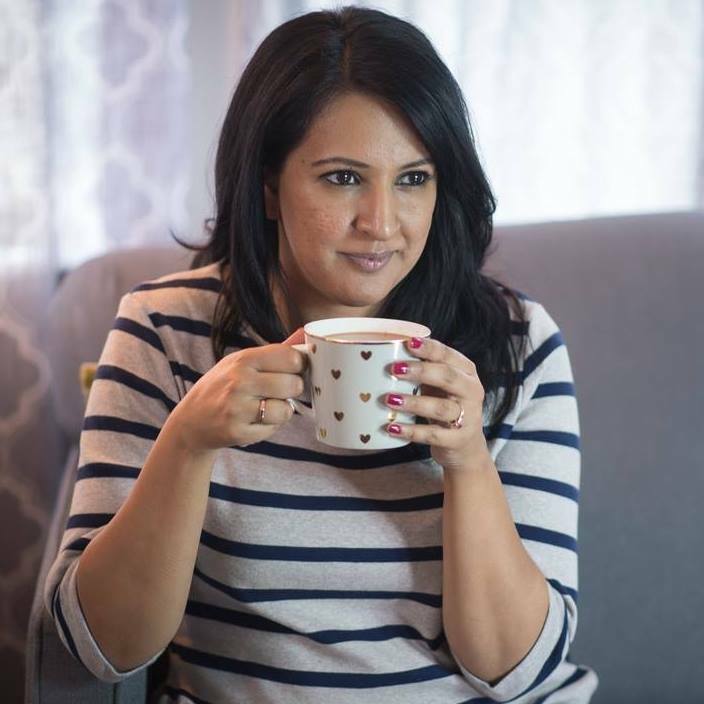 It would probably not surprise you at all that I have sung this song many many times to my kids when giving them baths – lol. I LOVE that you made this!!! So sweet! It is such a simple DIY but it makes me smile every time I see it!